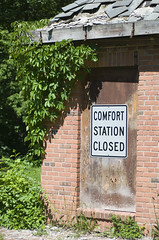 While on a little photo expedition this last weekend, Larry and I happened past a "Closed Comfort Station" off Hines Drive. The cool old building with a slate roof was long ago boarded up and left to slowly disintegrate. We spent about half an hour working the cool old building.